Val d’Orcia is one of the most spectacular places in the world. Have you ever thought about an engagement photography in Val d’Orcia? Enchanting hills, with green meadows, wheat fields, and centenarian cypresses. Everything looks like a painting that comes alive instantly. For the pre-wedding photo service of Chezia and Enzo, I decided to bring the future spouses here and to portray an engagement in Val d’Orcia. We left for Florence in the afternoon and after about two hours (and a stop for a coffee near Siena) we arrived near San Quirico D’Orcia. I know a beautiful place in the hills and we had to walk several kilometers on dirt road to reach it, but it was worth it! The scenery is breathtaking. They were really excited, the tranquillity and the peace of the Val d’Orcia hills got them relaxed right away and I managed to take photos where they where having fun. Their feelings were so clear that the photos turned out to be natural and spontaneous. Even though it was cloudy, I took advantage of sun’s rays: a few moments of light that worked perfectly for an engagement shooting. I like to take photos with no poses, without interfering in those romantic moments between the couple and so it was also for the engagement photography in the Val d’Orcia of Chezia and Enzo. While in Val d’Orcia you can dive in the middle of the wheat fields, feel the breeze coming from the nearby Mount Amiata and stroll through the dirt roads coloured by sunflowers and poppies. 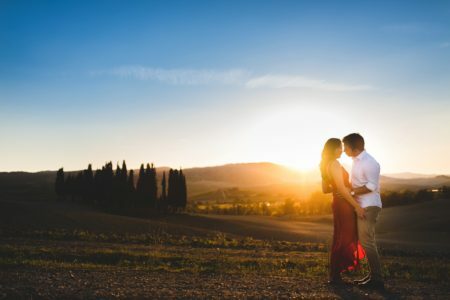 In addition to the meadows and grain fields, an engagement photography in Val d’Orcia can also be organised in one its the many historic villages, such as San Quirico d’Orcia, Castiglione d’Orcia, Rocca d’Orcia, Radicofani, Pienza, Montalcino, and Buonconvento. An engagement photography in Val d’Orcia could be one of the most beautiful memories of your life!